18 July 1918 – Nelson Mandela born in Mvezo, Eastern Cape province, South Africa. His mother, Nonqaphi Fanny Nosekeni, was one of four wives of his father, Nkosi Mphakanyiswa Gadla Henry Mandela. 1925 – Mandela begins primary school near his home village of Qunu, where a teacher unable to pronounce his African name of Rolihlahla gives him the name “Nelson” after British naval hero Admiral Horatio Nelson. Nelson Mandela in Mthatha in 1937, aged 19. 1930 – His father Nkosi Mphakanyiswa Gadla Henry Mandela dies. Mandela becomes the ward of the Thembu regent, Paramount Chief Jongintaba Dalindyebo. 1934 – At the age of 16, Mandela undergoes the Xhosa initiation and circumcision ritual. He enrols in the Clarkebury Boarding Institute in Engcobo. 1937 – Enrols in Healdtown, the Wesleyan college in the Eastern Cape town of Fort Beaufort. 1939 – Enrols at the University College of Fort Hare in Alice, Eastern Cape, for a bachelor of arts degree. Here he meets Oliver Tambo. 1940 – Expelled from university for joining in a protest boycott. 1941 – Fleeing an arranged marriage, Mandela moves to Johannesburg and works briefly as a night watchman on a gold mine. 1941 – Meets Walter Sisulu, an active member of the African National Congress (ANC), South Africa’s major anti-apartheid liberation movement and today the country’s ruling party. 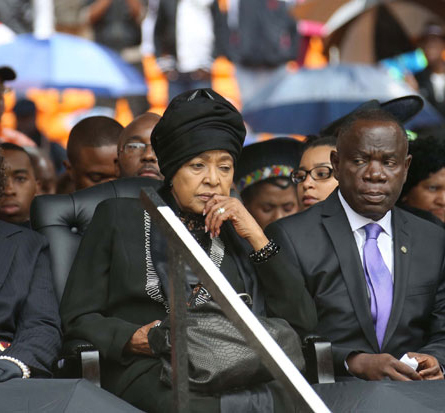 Sisulu recommends Mandela for employment as an articled clerk at the law firm Witkin, Sidelsky and Eidelmana, and the two become firm friends. 1942 – Begins to attend ANC meetings. 1942 – Completes his bachelor of arts degree by correspondence through the University of South Africa. 1943 – Enrols for an LLB postgraduate law degree at the University of the Witwatersrand. 2 April 1944 – Founds the ANC Youth League together with Anton Lembede, Oliver Tambo and Walter Sisulu. 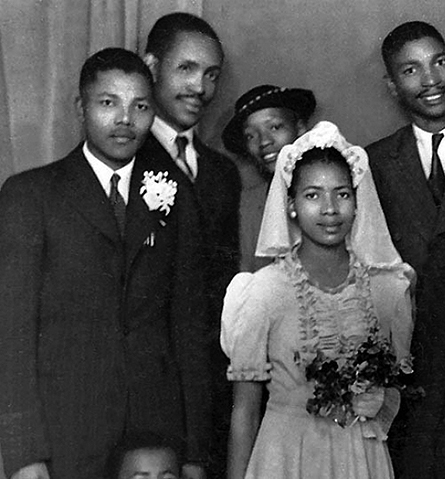 5 October 1944 – Mandela marries Evelyn Ntoko Mase, his first wife. 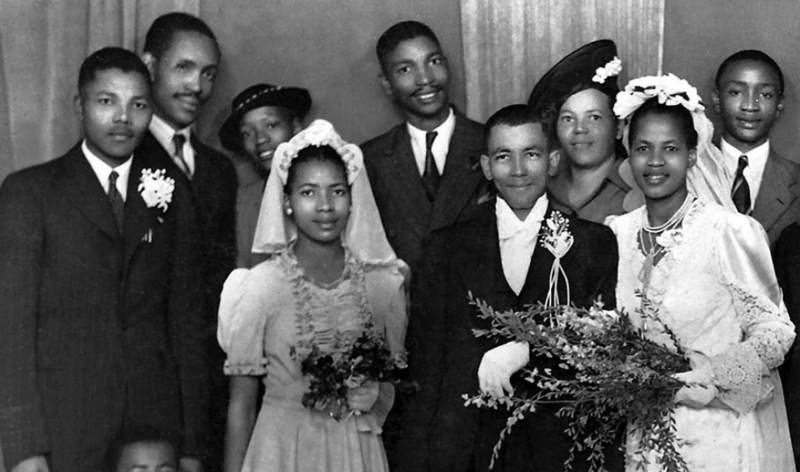 Nelson Mandela and his future first wife Evelyn Mase in the bridal party at Walter and Albertina Sisulu’s wedding on 17 July 1944. Mandela was best man. Mandela and Mase were to marry three months later, on 5 October 1944. 1946 – First son Madiba Thembekile (Thembi) born to Evelyn Mase. 1947 – Mandela’s first daughter and second child Makaziwe born to Evelyn Mase. The baby dies nine months later. 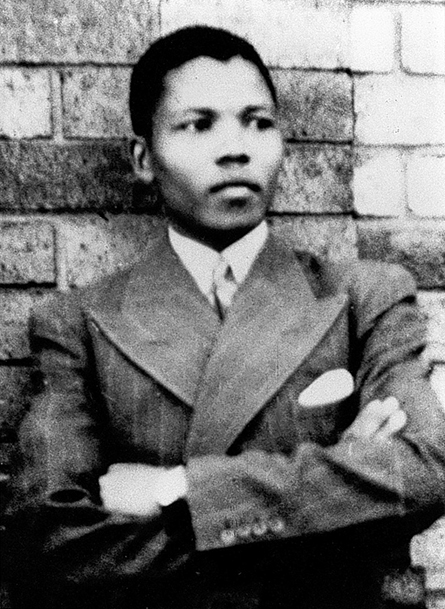 1948 – Mandela is elected national secretary of the ANC Youth League. 1948 – The whites-only electorate votes the racist National Party into power in South Africa. Apartheid becomes official government policy. 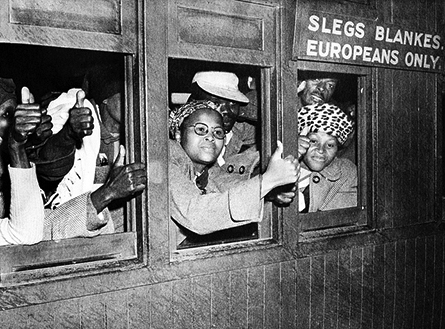 1949 – The ANC adopts its Programme of Action, inspired by the Youth League, which advocates the weapons of boycott, strike, civil disobedience and non-cooperation with authority. 1950 – The government passes the Suppression of Communism Act. This bans the South African Communist Party. It also bans the “ideology” of communism. The Act broadly defines “communism” as anything aimed “at bringing about any political, industrial, social, or economic change within the Union by the promotion of disturbance or disorder” or encouraging “feelings of hostility between the European and the non-European races”. 1950 – Mandela’s second son and third child Makgatho born to Evelyn Mase. 1951 – Elected president of the ANC Youth League. 1952 – The ANC launches the Campaign for Defiance of Unjust Laws, later simply known as the Defiance Campaign. Mandela is elected as the ANC’s national volunteer-in-chief and travels South Africa organising resistance. 1952 – Mandela is arrested and tried with Walter Sisulu and 18 others under the Supression of Communism Act for his role in the campaign. He is sentenced to nine months’ imprisonment with hard labour, suspended for two years. 1952 – Elected president of the Transvaal region of the ANC, and as the first of ANC deputy presidents. 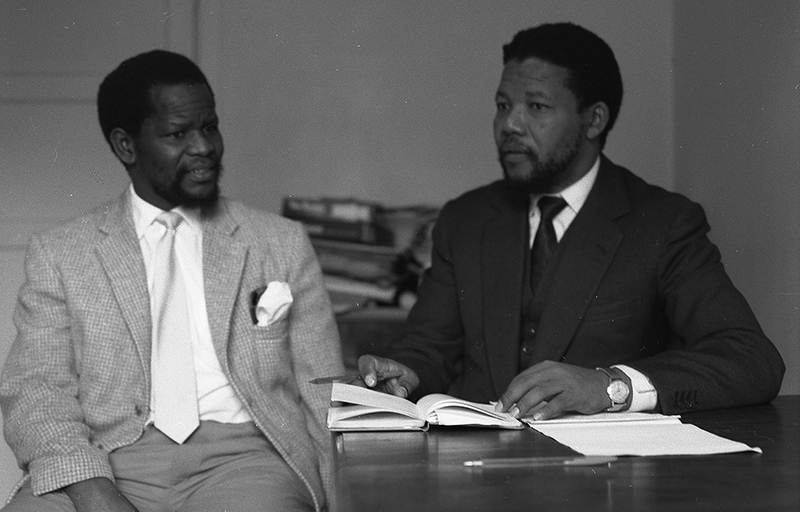 1952 – Opens South Africa’s first black-owned law firm in downtown Johannesburg in partnership with Oliver Tambo. 1953 – Devises the M-Plan – or Mandela Plan – for the ANC’s future underground operations. 1953 – Second daughter and fourth child born to Evelyn Mase, and named Makaziwe in honour of her infant sister. 5 December 1956 – Mandela and 150 others arrested and charged with treason. The marathon Treason Trial of 1956 to 1961 followed. All charges were eventually dropped. 1958 – Mandela divorces Evelyn Mase and marries Winnie Madikizela. 1959 – Third daughter and fifth child Zenani (Zeni) born to Winnie Madikizela-Mandela. 1959 – The Africanist faction of the ANC breaks away to form the Pan Africanist Congress under the leadership of Robert Sobukwe and Potlako Leballo. 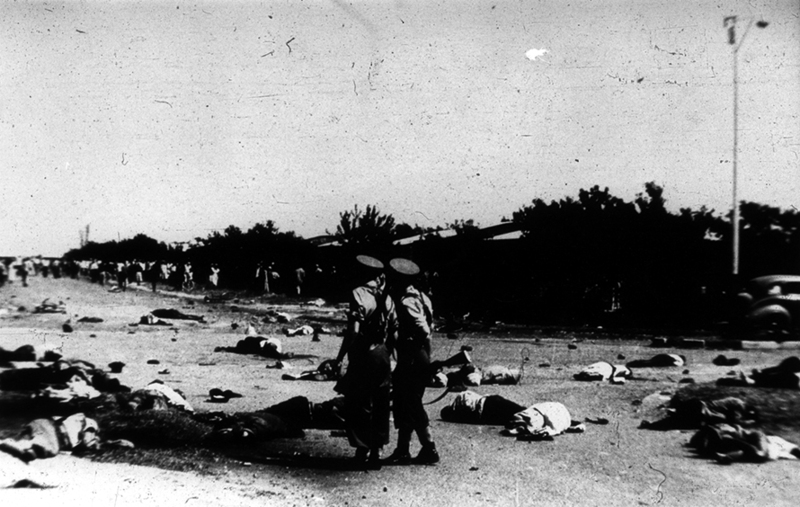 21 March 1960 – Police open fire on a peaceful demonstration against the pass laws organised by the PAC in the township of Sharpeville, killing 69 people – many of them shot in the back. The reaction is immediate, with demonstrations, protest marches, strikes and riots across South Africa. 30 March 1960 – The South African government declares a state of emergency, detaining more than 18 000 people, and banning the ANC and other liberation movements. 1960 – Mandela’s fourth daughter and sixth child Zindziswa (Zindzi) born to Winnie Madikizela. 1961 – The Treason Trial ends with all charges against Mandela and his co-defendants being dropped. 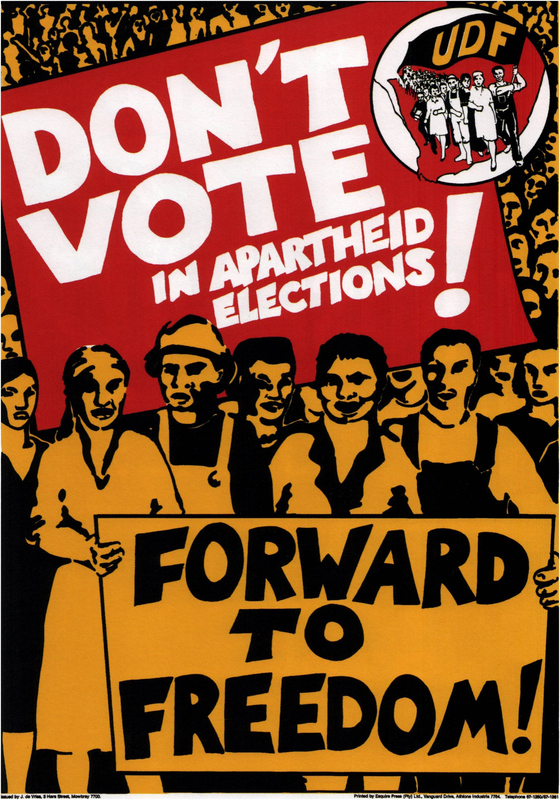 1961 – The ANC decides to move from nonviolent to violent means of opposing apartheid. The movement’s armed wing, Umkhonto we Sizwe (“Spear of the Nation”), is formed, with Mandela as commander-in-chief. 1961 – In the face of government repression, Mandela goes underground, becoming a master of disguise and managing to evade arrest with such success the media nicknames him the Black Pimpernel. 5 August 1962 – After travelling abroad, and being on the run for 17 months, Mandela is arrested near Howick in Natal and imprisoned in the Johannesburg Fort. He would only be free again in 1990, 28 years later. 25 October 1962 – Mandela is convicted of unlawfully exiting the country and incitement to strike. He is sentenced to five years on Robben Island, the notorious political prison off the coast near Cape Town. 11 July 1963 – While Mandela is in prison, police arrest prominent ANC leaders at their hideout on Liliesleaf Farm in Rivonia, north of Johannesburg. 1963 – Mandela and his arrested ANC comrades are charged with sabotage and other crimes in the Rivonia Trial. 20 April 1964 – At the opening of the defence case at the Pretoria Supreme Court, Mandela makes his famous statement from the dock at the Rivonia Trial, in which he lays out the reasoning in the ANC’s decision to use violence. 12 June 1964 – The Rivonia Trial ends with Mandela and all his co-accused – except Rusty Bernstein – being found guilty and sentenced to life imprisonment. Mandela is sent to Robben Island. As a D-group prisoner, the lowest classification, he is allowed one visitor and one letter every six months. 1965 – Mandela’s book No Easy Walk to Freedom is published by Heinemann. 1968 – Mandela’s mother, Nonqaphi Fanny Nosekeni, dies. 1969 – A plan to spring Mandela from jail is infiltrated by secret agent Gordon Winter. Winter is working for the South African authorities, who want Mandela to escape so they can shoot him during recapture. The plot is foiled by British Intelligence. 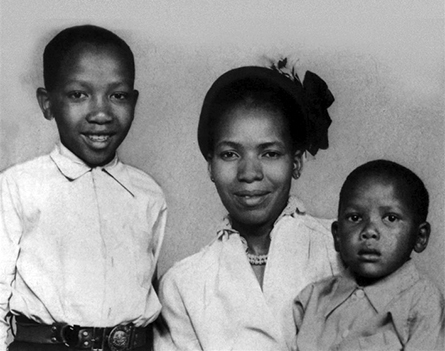 Mandela’s sons Thembekile (left) and Makgatho with their mother Evelyn Mase in the early 1950s. When Thembekile died in a car crash in 1969, aged just 23, Mandela was not allowed to attend his funeral. 1969 – Mandela’s first-born son Thembi Mandela dies in a car crash, aged 23. Mandela, on Robben Island, is not allowed to attend the funeral. 1969 – Winnie Madikizela-Mandela is jailed at Pretoria Central Prison, where she will spend the next 18 months in solitary confinement. 1973 – Daughter Zenani Mandela marries Prince Thumbumuzi Dlamini, elder brother of King Mswati III of Swaziland. 1973 – A nuclear particle discovered by University of Leeds scientists is named the “Mandela particle”. 16 June 1976 – In Soweto, South African police open fire on schoolchildren protesting against the use of Afrikaans as a medium of instruction. The Soweto Uprising begins, quickly spreading across South Africa. By the end of the year about 575 people have died, 451 at the hands of police. Thousands of young people leave South Africa to join the ANC’s forces in neighbouring countries. March 1982 – Mandela is transferred from Robben Island to Pollsmoor Prison in Cape Town, along with other ANC leaders Walter Sisulu, Andrew Mlangeni, Ahmed Kathrada and Raymond Mhlaba. It is speculated that this is to remove their influence on a new generation of young black activists imprisoned on Robben Island. 26 June 1983 – Sculpture in a city park by Elisabeth Frink, dedicated to Mandela, is unveiled in Dublin, Ireland. As second sculpture was unveiled in Dublin a year later. A 1984 United Democratic Front poster calling on white, coloured and Indian South Africans to boycott separately organised apartheid elections. 20 August 1983 – The United Democratic Front (UDF), a coalition of about 400 civic, church, students’, workers’ and other organisations, formed to fight apartheid inside South Africa. With the slogan “UDF unites, apartheid divides”, its 3- million members were a powerful force in the internal anti-apartheid struggle. 1984 – English ska band The Special AKA release the song “Free Nelson Mandela”, which reaches number nine on the British charts. The song was banned in South Africa, but bootleg tracks found their way into many parties. February 1985 – President PW Botha offers to free Mandela on condition that he unconditionally rejects violence as a political weapon. 28 October 1985 – Statue of Mandela is unveiled in Southbank in London by Oliver Tambo, now the exiled president of the ANC. November 1985 – Minister of Justice and Prisons Kobie Coetsee meets Mandela in Volks Hospital in Cape Town, where Mandela is recovering from prostate surgery. This is the first meeting between Mandela and the National Party government and is followed by a series of tentative meetings that lay the groundwork for future negotiations. But little progress is made. 1985 – Stevie Wonder dedicates his Oscar for the song “I Just Called to Say I Love You” to Mandela. Wonder’s music is then banned by the state-run SABC, the South African Broadcasting Corporation. 1988 – Mandela is transferred from Pollsmoor Prison to Victor Verster Prison near Paarl in the Western Cape. A number of restrictions are lifted, and friends and family are able to meet him. 1988 – The Nelson Mandela 70th Birthday Tribute concert is held at London’s Wembley Stadium. 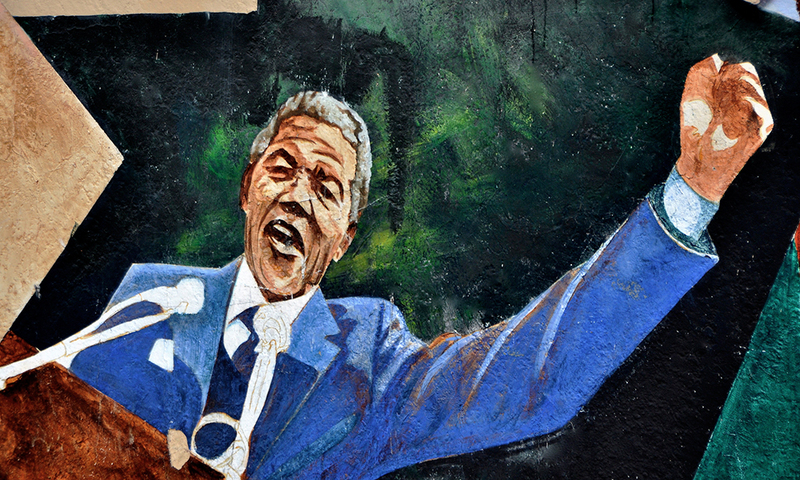 It was a focal point of the external anti-apartheid movement, with prominent musicians – including Simple Minds, Santana, Tracy Chapman, Salif Keita, Annie Lennox and Whitney Houston – voicing their support for Mandela. 1989 – President PW Botha Botha is replaced by FW de Klerk. 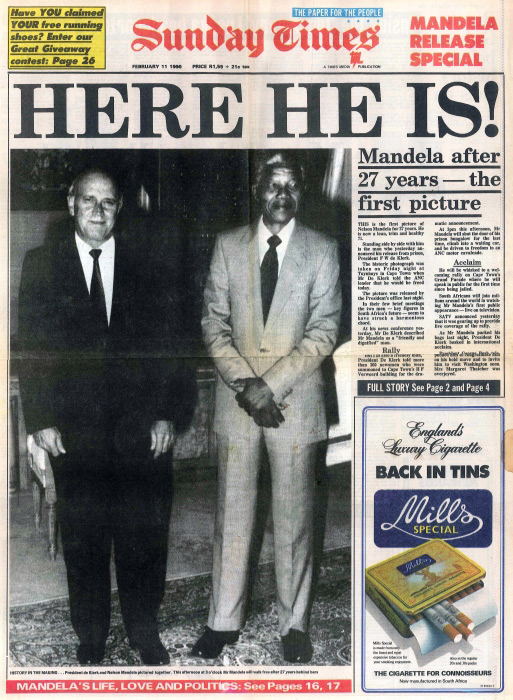 2 February 1990 – President FW de Klerk announces Mandela and other political prisoners will be released and the ANC and other resistance movements unbanned. 11 February 1990 – In the full glare of international media attention, Mandela walks free from Pollsmoor Prison in Cape Town. 4 May 1990 – Negotiations to end apartheid between the ANC and the government begin at the presidential residence, Groote Schuur. They issue the Groote Schuur Minute, a joint commitment to resolve the existing climate of violence and intimidation and to remove practical obstacles to negotiation, including indemnity from prosecution for returning exiles and the release of political prisoners. 6 August 1990 – The ANC and the government extend their consensus in the Pretoria Minute, which includes the suspension of the armed struggle by the ANC’s military wing, Umkhonto weSizwe. 1991 – The first national conference of the ANC held inside South Africa in decades elects Mandela as president of the party. Oliver Tambo, the previous president, becomes national chairperson. 20 August 1991 – The United Democratic Front is disbanded. 14 September 1991 – The National Peace Accord is signed by representatives of 27 political organisations and national and homeland governments, preparing the way for the Convention for a Democratic South Africa (Codesa) negotiations. 20 December 1991 – Plenary session of Codesa at the World Trade Centre in Kempton Park, near Johannesburg. 18 March 1992 – After the National Party begins to lose by-elections to the pro-apartheid Conservative party, a referendum of white voters is held to determine if FW de Klerk has their mandate to end apartheid. An overwhelming 68% votes “yes”, allowing negotiations to proceed. April 1992 – Mandela and Winnie Madikizela-Mandela separate. May 1992 – Codesa II begins the second round of negotiations. 17 June 1992 – The Boipatong massacre. During the night, a heavily armed band of Inkatha Freedom Party loyalists invade the Vaal township of Boipatong and kill 46 people. Mandela accuses the government of complicity in the atrocity and withdraws the ANC from negotiations. The ANC takes to the streets with a programme of rolling mass action. 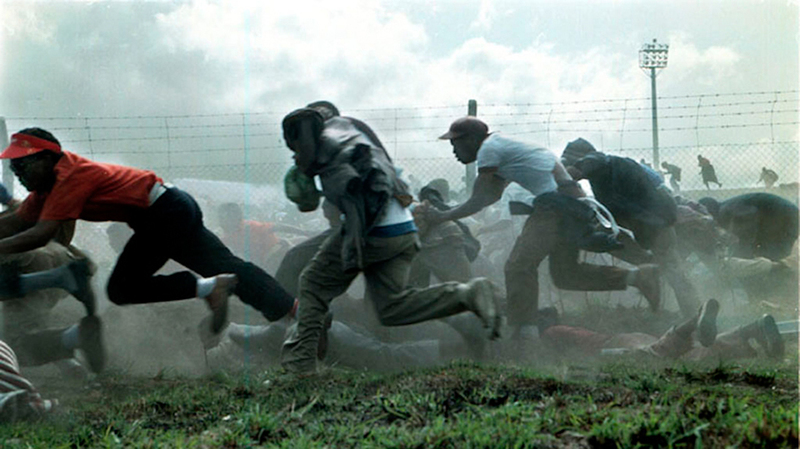 7 September 1992 – The army of the spurious “homeland” of Ciskei opens fire on protest marchers near Bhisho, killing 28. The Bhisho massacre brings a new urgency to the search for a political settlement. 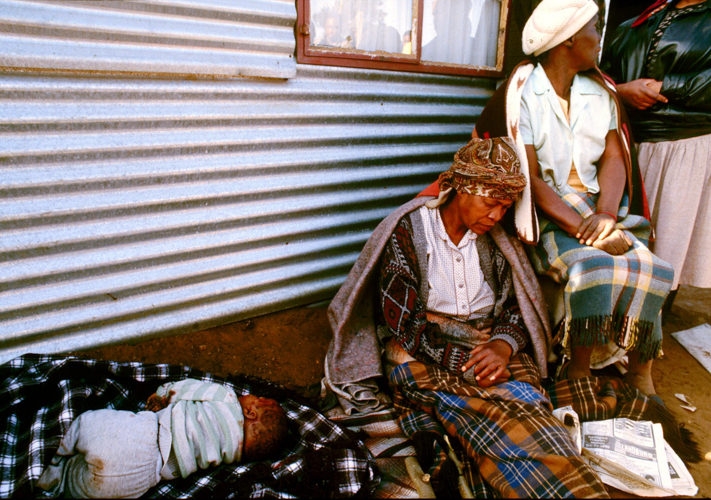 26 September 1992 – Negotiations resume when the government and ANC agree on a Record of Understanding dealing with a constitutional assembly, an interim government, political prisoners, hostels, dangerous weapons and mass action. 1 April 1993 – The Multiparty Negotiating Forum (MPNF) gathers for the first time, with political groupings on the more extreme right and left taking part, as well as traditional African leadership. 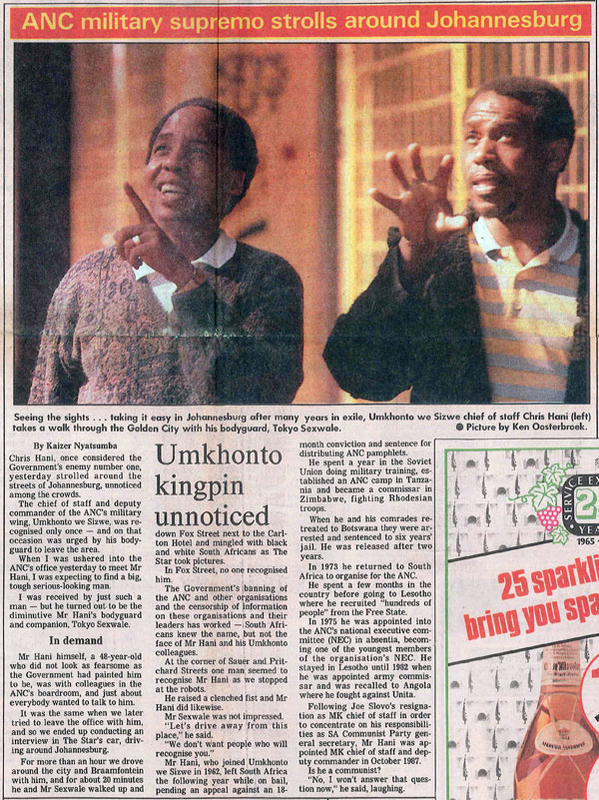 On 20 June 1990 Tokyo Sexwale (right) showed Chris Hani, recently returned from exile, around Johannesburg. Hani was murdered three years later, in April 1993. 10 April 1993 – Chris Hani, the leader of the South African Communist Party and a senior member of the ANC, is assassinated outside his home by right-wingers intent on derailing negotiations. Instead, faced with a country on the brink of civil war, the main parties push for a settlement. Polish immigrant Janusz Waluś and senior Conservative Party leader Clive Derby-Lewis are later jailed for life for the crime. 18 November 1993 – The MPNF ratifies the interim Constitution in the early hours of the morning. A Transitional Executive Council will now oversee the run-up to a democratic election. 10 December 1993 – Mandela and FW de Klerk are jointly awarded the Nobel Peace Prize for their different roles in ending apartheid. December 1993 – Mandela is named Person of the Year by Time magazine, together with FW de Klerk, Yasser Arafat and Yitzhak Rabin. 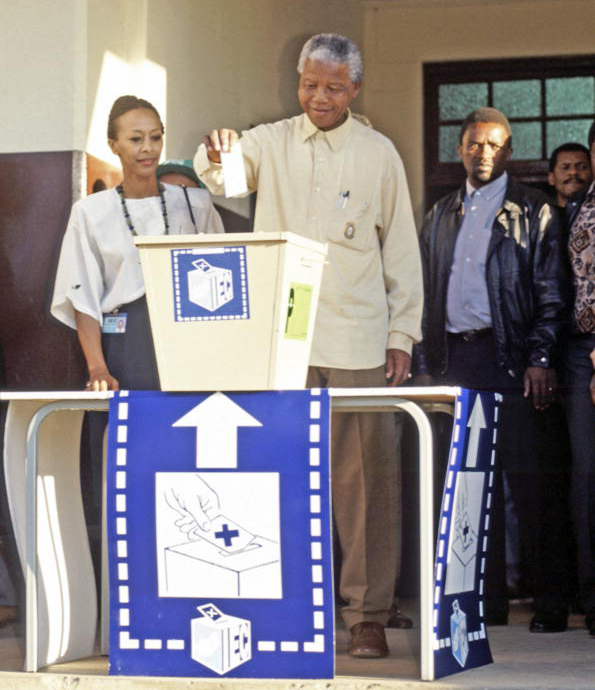 27 April 1994 – South Africa’s first democratic elections are held, and Mandela gets to vote for the first time in his life. The ANC wins 62% of the vote. 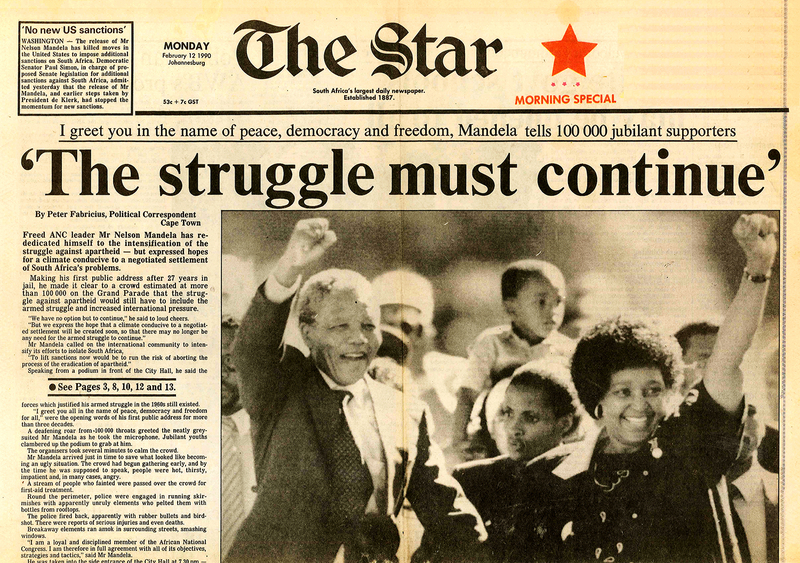 10 May 1994 – Mandela is inaugurated as South Africa’s first democratically elected president. 1994 – Mandela publishes his autobiography Long Walk to Freedom, which he started writing in prison. 1995 – The Truth and Reconciliation Commission is set up in terms of the Promotion of National Unity and Reconciliation Act. It is headed by Anglican Archbishop Desmond Tutu. 1995 – South Africa hosts, and wins, the Rugby World Cup. Rugby was previously seen as a whites-only sport, but Mandela gave the country’s team much high-profile support. After the Springboks beat New Zealand in the final, Mandela presented the trophy to captain Francois Pienaar, an Afrikaner, wearing a Springbok shirt with Pienaar’s number 6 on the back. This important step in reconciliation was popularised in the movie Invictus, starring Morgan Freeman as Mandela and Matt Damon as Pienaar. March 1996 – Mandela and Winnie Madikizela-Mandela divorce. 18 July 1998 – On his 80th birthday Mandela marries Graça Machel (née Simbine), widow of Samora Machel, the president of Mozambique until his death in 1986. 2 September 1998 – Mandela is appointed the 19th secretary-general of the Non-Aligned Movement. 14 June 1999 – Thabo Mbeki succeeds Mandela as president of South Africa. July 2001 – Mandela is diagnosed and successfully treated for prostate cancer. 9 July 2002 – US President George W Bush awards Mandela the Presidential Medal of Freedom, the United States’ highest civilian award, in Washington. 2003 – Mandela lends his name to the 46664 Aids awareness and fundraising campaign, named for his former prison number. 2004 – Mandela’s first wife Evelyn Mase dies. 6 January 2005 – Mandela’s oldest living son Makgatho Mandela dies of Aids, aged 54. 18 July 2007 – On Mandela’s 89th birthday he, Graça Machel and Desmond Tutu convene The Elders, a grouping of world leaders set up to contribute their wisdom and independent leadership to solving the world’s toughest problems. Other members include Kofi Annan, Ela Bhatt, Gro Harlem Brundtland, Jimmy Carter, Li Zhaoxing, Mary Robinson and Muhammad Yunus. 18 July 2008 – Mandela’s 90th birthday is marked across the world, with the main South African celebrations held at his home town of Qunu. A concert in his honour is held in Hyde Park, London. November 2009 – The UN General Assembly announces that Mandela’s birthday, 18 July, is to be known internationally as Mandela Day. 26 January 2011 – Mandela admitted to hospital with an acute respiratory infection, and discharged three days later. 21 June 2011 – Michelle Obama and her daughters Sasha and Malia visit Mandela at his Houghton home. November 2012 – New South African bank notes are issued with Mandela’s portrait as the main image. South African slang for paper money quickly becomes “Madibas” or “Mandelas”. 18 to 26 December 2012 – Mandela is admitted to hospital for tests. He is discharged on 26 December after treatment for a lung infection and gall stones, having spent the longest period in hospital since his release from prison. 9 March 2013 – Mandela is again admitted to hospital, for treatment of lung disorders, in the first of many hospitalisations over the next few months. 18 July 2013 – Mandela celebrates his 95th birthday while again undergoing treatment at a Pretoria hospital. Doctors describe his condition as “stable but critical”. 1 September 2013 – After almost three months in hospital, Mandela is discharged with a full medical team to his home in Houghton, Johannesburg. 5 December 2013 – Mandela dies at his home in Houghton at the age of 95. An official 10-day period of mourning is declared in South Africa. 10 December 2013 – A memorial service for Mandela is held at Soccer City Stadium near Soweto in Johannesburg. It is attended by global leaders and thousands of South Africans. 11 to 13 December 2013 – Mandela’s body lies in state at the Union Buildings in Pretoria for South Africans to say goodbye. 15 December 2013 – Nelson Mandela’s state funeral is held in Qunu in the Eastern Cape, where he is buried.